Springtails are small (1⁄6 to 1⁄5 inch long) wingless nsects that live in the soil but will enter homes, particularly during periods of vey wet or very hot, dry weather. The most common species in our area are whitish-gray to brown color, although you can find species that are lavender-red or metallic blue in color. They get their name from their ability to catapult themselves through the air by means of a forked tail-like structured called a furcula (Figure 1), which is attached on the underside of the abdomen. The ability to "leap" in the air often leads people to confuse them wth fleas. Springtails can be found almost everywhere outdoors. They primarily live in the soil, in leaf mold, organic mulches, under tree bark, in decaying logs, and may even infest potted plants. They are most abundant in damp or moist areas. Some species are found outdoors in the winter on snow-covered surfaces and are called "snow fleas." Springtails play an important ecological role as decomposers (you can read more about them in a 1998 article in Wisconson Natural Resources Magazine). They also feed on algae and fungi and a few species may damage commercial mushrooms and seedlings in hotbeds and greenhouses. As the soil / mulch dries out during prolonged periods of dry weather, the insects will move. They may be found congregating near any source of moisture, such as air conditioner condensate lines (Figure 2), lawn sprinkler heads, etc . They will be seen in large numbers that give a soot-like appearance on walls, floors, driveways, etc. Eventually, they make their way indoors. The most common areas where they're being found are your obvious sources of moisture, such as around exterior doors and windows, in sinks, bathtubs and around commodes. In many cases, springtails may be so numerous around sinks and tubs that people assume that the insects are coming out of the drains. Springtails may also enter the living areas of a home from the crawlspace. The insects are often reported in and around new commercial and residential construction, possibly because they were brought in with freshly spread topsoil and mulch. In some cases, springtails may crawl onto construction materials stacked at a job site and may be accidentally "built in" to a house under construction. However, when construction is completed and humidity levels drop indoors, the springtails should die off. Figure 2. 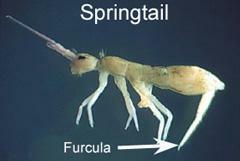 Springtails may congregate around areas of high moisture such as air conditioner condensate lines. Some suggested non-chemical solutions to this problem have included keeping the soil and mulch moist by watering them regularly or by removing the mulch entirely. However, aside from the aesthetic issue, mulch is extremely valuable for weed management and for reducing the loss of soil moisture. So, we don't encourage its removal if at all possible. If anything, these measures are likely to be temporary solutions, if they work at all. This is particularly true during drought conditions and where municipalities may restrict the use for watering landscaped areas (in which case, the mulch becomes even more valuable). Because springtails are usually a problem during hot dry weather, chemical control can be difficult. The most common cause of ineffective control is inadequate spray volume. Using one of those 1-2 gallon pump sprayers will not do the job. When soils and mulches dry out, any pesticides applied to these areas will bind in the thatch layer on lawns, in the mulch, and at the surface soil, which means that you do not get the coverage needed to stop these insects. 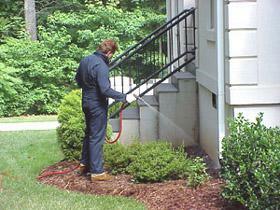 Pest management professionals use spray equipment capable of applying 20 or more gallons around a structure (Figure 3). For the 'do-it-yourself' approach, treatments are best done using a garden hose sprayers in order to apply the necessary volume. If there is a thick layer of mulch around the house, it must be raked back at least 3-feet so the underlying soil can be treated. In most cases, a barrier treatment consists of an area about 3-5 feet wide around the house (or more if preferred), plus about 2 feet of the lower foundation walls as well. Chemicals available for such treatments are listed in the North Carolina Agricultural Chemicals Manual. You can use any of the products listed for control of millipedes, centipedes and clover mites. Although granular insecticide products are easier to apply, they are less likely to work in dry conditions because they need moisture in the soil. Unless you know that it will rain or that the treated area can be irrigated after applying the chemical, then stick with applying liquid insecticides. Indoors, aerosol sprays of any common household insecticides may provide very temporary relief. The best type of indoor treatment is a "crack & crevice" application which is done with a product that has a straw-like injector nozzle similar to a can of WD-40. Chemicals available for such treatments are listed in the North Carolina Agricultural Chemicals Manual, similar to ones used for carpet beetles and cockroaches. If your problem continues indoors, you may have to check for signs that springtails have invaded the crawlspace. Applying pesticides in your crawlspace is somewhat more hazardous than spraying outdoors, so you might want to hire a professional for this job. 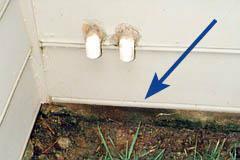 If you attempt it yourself, be sure to check under the insulation, particularly near the band and around plumbing penetrations in case there is excess moisture or an undetected leak that might attract springtails to congregate in these areas. REMEMBER: Before applying any pesticides, always read the label and follow ALL directions and safety precautions. Figure 3. Perimeter spraying of an insecticide.